It's so great to be a part of anything like this. I can't believe I'm actually here. I've had a writer crush on Eve Golden for a long time. With a background in journalism and a lifelong dedication to classic film geekery, she is truly meant to write about the golden age of Hollywood. She clearly loves her topic, which makes reading her books as enjoyable as having a cup of coffee with a fellow fan. I'm particularly fond of Golden's biographies of Jean Harlow and Theda Bara, which cleared up a lot of misperceptions about these actresses. 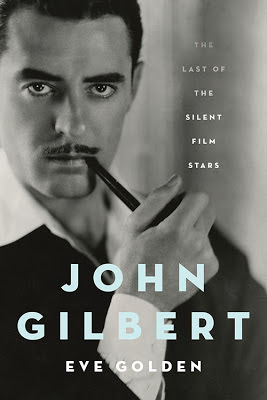 For that reason, I was delighted to receive her recent biography of John Gilbert. Now here was a man who needed someone to clarify his past. Like Clara Bow, I think Gilbert had such a dreadful childhood that he was never going to be very happy. The fact that he found enormous success in the profession of his choice, and some fleeting personal and professional pleasures is miraculous. He may have suffered deeply, but he also pulled himself up to great heights with very little support. The book begins with his early days as a theater tot, following his actress mother Ida Pringle on the road. His father, also on the stage, was known as Johnnie Pringle and was mostly absent from his childhood. Ida carved out a decent career for herself, but her success did not extend to parenting. Often she would tire of young Jack and lock him away in the closet for hours. On occasion she would also wake him in the middle of the night to introduce her to a new beaux, calling him his new father. This understandably made Gilbert a bit bitter. 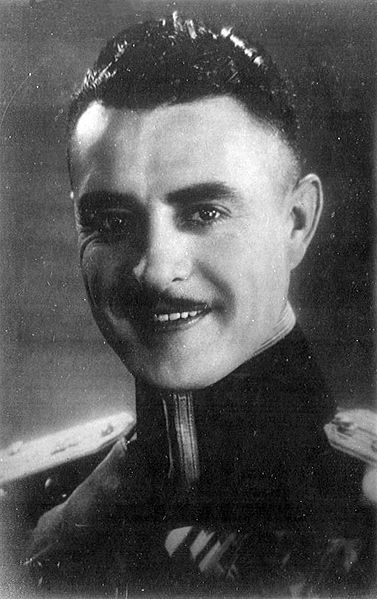 He found better support from his stepfather Walter Gilbert, who would eventually use his connections to help him break through in the movies. When Jack decided to make a go of acting onscreen, he jumped in with both feet, mingling with Chaplin and Richard Barthelmess at the Athletic Club in Hollywood and working long hours on any aspect of filmmaking at whatever studio would hire him. He soon found himself in front of the cameras at MGM, working opposite Lon Chaney and soon-to-be lifelong gal pal Norma Shearer for the circus drama, He Who Gets Slapped (1924). A glorious career at MGM followed, with classics including WWI epic The Big Parade (1925), The Merry Widow (1925) and his legendary romances costarring Greta Garbo, Flesh and the Devil (1926) and Love (1927). Gilbert became the ultimate matinee idol, on top of the box office and payroll, though fiercely hated by his boss Louis B. Meyer. There have been lots of rumors about the rivalry between these two over the years, including shouting matches and fistfights. Golden does her best to uncover the truth, but since there is no way of definitely determining what made these two clash, she lays out the facts and cautions the reader not to rush to conclusions. 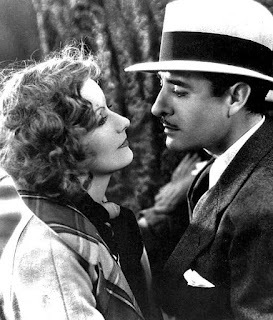 Another legend about Gilbert: his torrid--or maybe not?--romance with Greta Garbo. He clearly loved her, but the Swedish star seems to have found him mildly amusing to annoying. There has long been a rumor that Garbo left Jack at the altar. Golden refutes this, and notes there is no proof they even went to bed together. It is a little more clear why Gilbert flailed when the talkies came to town. Basically, a lot of horrible things happened, but his voice was not necessarily one of them. We all can hear for ourselves that he spoke quite well in movies like Queen Christina (1933) (a role he won thanks to the insistence of Garbo). The problem seems to be that he was so nervous to be recorded that the quality of his entire performance, including vocals, was affected. It did not help that Mayer was out to destroy him and the purple prose from the title cards in his old romances sounded so silly when spoken that it turned his early talkies into unintentional comedies. I think Gilbert could have gone on in talkies somehow, but he just didn't have the strength to find his way. Amazing opportunities slipped away from him, such as the leads in Grand Hotel and Red Dust. Losses like these hurt him deeply; he was too sensitive to manage the pain of failure and move on. Instead he drank so much that he gave himself bloody ulcers. Finally, his body could no longer take the abuse. He died of a heart attack at home in 1936. This was a story which required delicacy in the telling and I felt that Golden was a sympathetic guide. Gilbert was a storyteller, and she picks through his tall tales carefully, finding the truth where possible and making a few educated guesses as to what motivated the lies. It's a complex story and that attention to detail was crucial. I appreciated the background details of both the time and Jack's life. It was useful to be able to place him among the scandals of the twenties. He had his issues, but Gilbert mostly stayed out of trouble. It was also fascinating, if horribly depressing, to learn of the ways various events, like the birth of the talkies, that rocked Jack affected the rest of the industry. I was especially saddened to learn of the hundreds of musicians who committed suicide when they were no longer needed to accompany films in theaters. Details like these bring richness to Gilbert's story, in addition to making a book an interesting document of early Hollywood. Most of all, I liked the emphasis on Jack's successes. Yes, he endured a lot of tragedy, and things did not end well for him, but he was also a dynamic, talented and essentially decent man who lived an amazing life. You get that from the book, the bitter with the sweet. And isn't that Hollywood? Deepest thanks to the University Press of Kentucky for providing a copy of the book for review. Thank you for the review. I have this waiting on my Kindle and am looking forward to diving into it. I, too, admire Eve Golden, so I know it's going to be a good read. 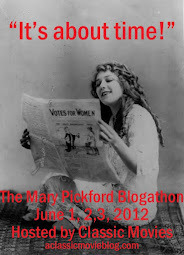 Hi Marsha--I think you'll love the book. It's an amazing story, and the focus on his success really helps you to deal with the downside. I hope you get to it soon!